This text explores the relationships between the Tarot, kabala, astrology and ancient numerology. Integral to this system is the correspondence of the 12 zodiacal signs and 36 decanate constellations with the Major and Minor Arcana. 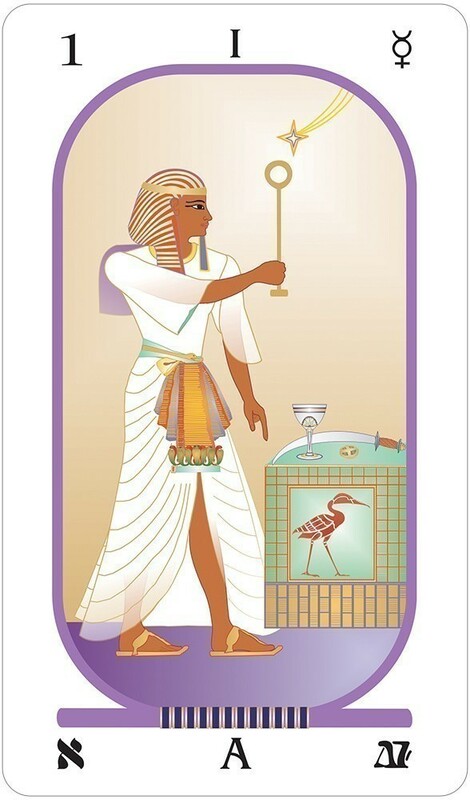 The Brotherhood of Light Tarot deck also integrates the symbolism of colors and geometric shapes. The back of the cards, inspired by the traditional “carpet pages” found in illuminated ancient manuscripts, features two mirrored images with core diamond shapes. The original black and white version of this deck was published in 1936 by the Church of Light with card designs by Gloria Beresford. 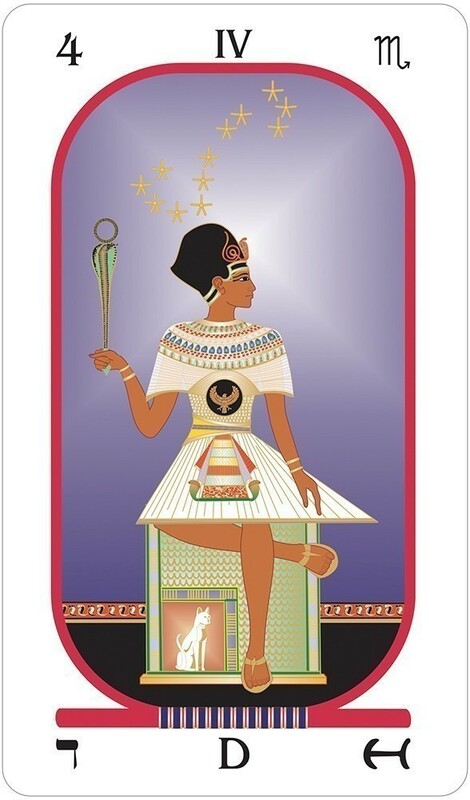 In 2003 Vicki Brewer redrew the original black and white images, and in 2009 she redesigned the cards as full-color Egyptian Tarot cards. Accompanying the Tarot deck is a 48-page instruction booklet, excerpted from The Sacred Tarot, which provides brief descriptions and interpretations for each of the 78 cards; 22 Major Arcana, 40 Minor Arcana, and 16 Court Cards. Also included are instructions for reading the Tarot cards using two popular spreads. Cards measure 2.5" x 4.25"
I loved the coloring in this deck, which is pastels of yellow, green, blue and orange. The theme is, of course, Egyptian, with the artwork being very minimalist. The Minor Arcana are Marseilles style, showing icons only. I liked the arrangement of the icons: Aces are the icon standing alone -- no hand coming out of the clouds here. For the Deuces, the Scepters and Swords are crossed, while the Cups and Coins are side by side. The treys are all in the form of a triangle, while the Four’s are in the form of a square. The Fives are all grouped together, with the Scepters and Swords crossed, and the Cups and Coins both form “X’x”. The Six’s show two triangles, while the Seven’s show an upper triangle and a lower square. The Eight’s show two squares, while the Nine’s show three triangles. The Ten’s show two triangles and a square. The only figures facing forward in this deck are the King of Coins, the King of Cups, the Veiled Isis, and the male figure in The Two Paths, The esoteric imagery in this deck is blended in well -- the Magician’s table is a cube, Isis Unveiled and the Sovereign sitting on cubes, the Charioteer has a sword in his right hand and a scepter in his left hand and so on. It is interesting to note that the Martyr has his hands tied at the wrist, instead of being free. I love that The Reaper has a beautiful rainbow over his head! The Black Magician shows a crocodile-like figure with wings, holding a flaming torch with what appears to be a snake in front of him. The Tower, of course, is depicted as a pyramid. The two mountains in The Moon have been replaced with pyramids. The Sun shows two adults, as opposed to two children. I adore The Sarcophagus, which shows a male figure, a female figure, and a child’s figure, wrapped as mummies, coming out of a sarcophagus! Instead of a dog, The Materialist gets a crocodile-like companion also. I love this deck -- the coloring and minimalist imagery brings me a sense of peace. I would advise, however, that it be used with the companion book (which I need to purchase!). 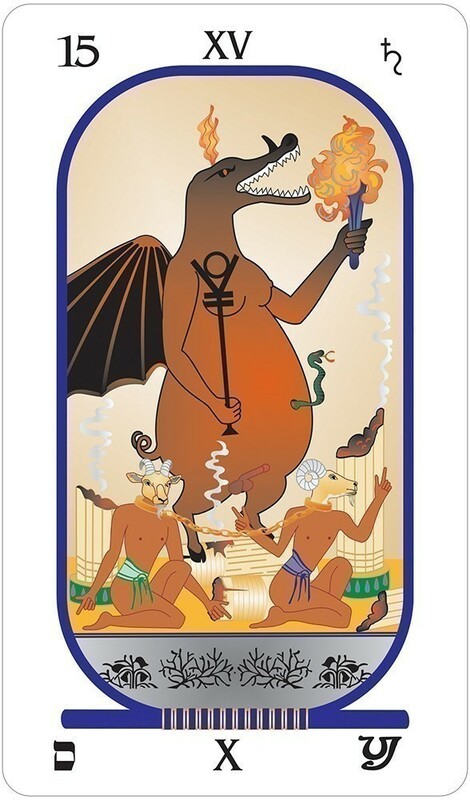 It would be of interest as a theme deck (Egyptian), for the artwork (Egyptian minimalist), as a collector’s deck, or as a reading deck for someone with a basic knowledge of the Tarot. 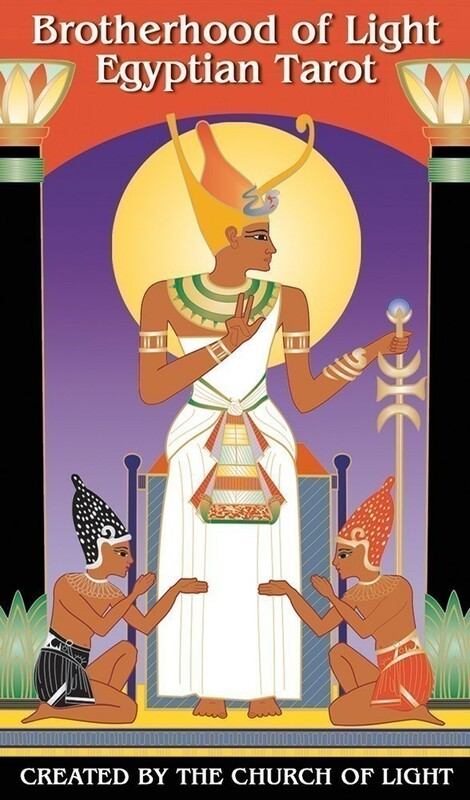 US Games Systems has just released a color deck of The Brotherhood of Light Egyptian Tarot Cards. 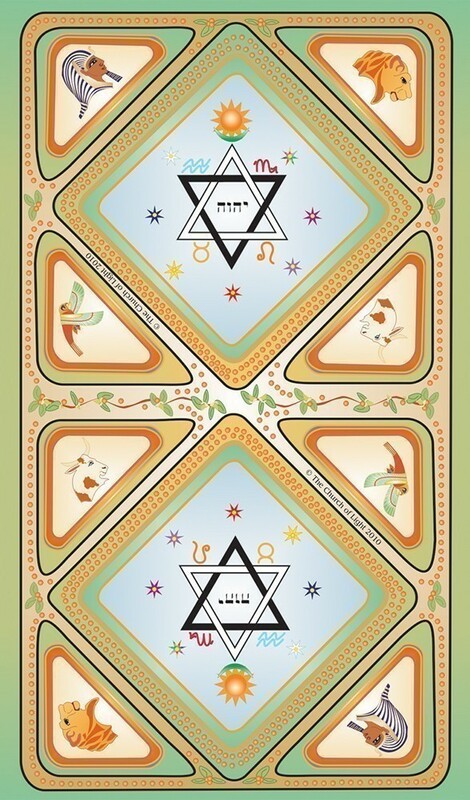 These cards are simply rich -- from the mythology, symbols, astrology, Hebrew characters, numerology and the teachings of the Kabbalah -- each one is a feast to feed one's mind and soul. I recently received the deck with it's little instruction booklet, and just the key on the front makes me giddy. The circle of the key is divided into the four suits with the numbers 1 through 9 corresponding to planetary positions within constellations. For example, 3 of Swords (or Trey of swords, I love the old-fashioned aspects of this deck) shows Mercury, Capricorn and Virgo. The post of the key contain the major arcana, while the teeth contain the court cards. Rather than going through the suits, the section on the minor arcana goes through the numbers, associating each with a particular planet, giving the divinatory significance of each card as well as its' inner interpretation. Following the Hermetic tradition, the cards an integral part of an internally consistent exposition of occult sciences. Astrology, alchemy and magic are continuously expressed through color, symbol and glyph. Each card is actually a cartouche, containing a message for the seeker. "What the tarot can be made to reveal is limited only by the capacity for understanding of the person using it " (from the booklet). I have been really enjoying playing with this new deck as it synthesized my own interests in both tarot and astrology. Having the planets and signs expressed on each card gives me instant access to more information that I can share with my client. One of the things I really love about the method used with this deck is how the Horsemen are portrayed. The Horsemen are placed in the deck where we usually see Knights. However, they play an interesting role in the deck: "The Horsemen do not represent people, but denote thoughts or unseen intelligences. In divination they are read as thoughts or intelligences that have an influence upon the life of the client." Surprisingly, even though the Minors required me to refer to the LWB, the readings were accurate. I didn't expect the deck to read as well as it does, considering I have to look up the meanings for most cards. So even if one is not yet familiar with the method used for the Minors, it doesn't mean accurate readings can't be given. The Little White Book is 48 pages. It begins with an introduction to the deck and information about the cards' back design. The Major Arcana are each given a keyword or two, along with interpretations for the Spiritual, Intellectual and Physical meanings. This is followed by a sort of old world, sometimes enigmatic, message. The Minors are arranged in the book by numbers: all Twos together, all Threes together, etc. There is a paragraph describing the celestial correspondence with each number, along with the various areas of influence the number covers. Then each card is given a simple divinatory and inner interpretation. 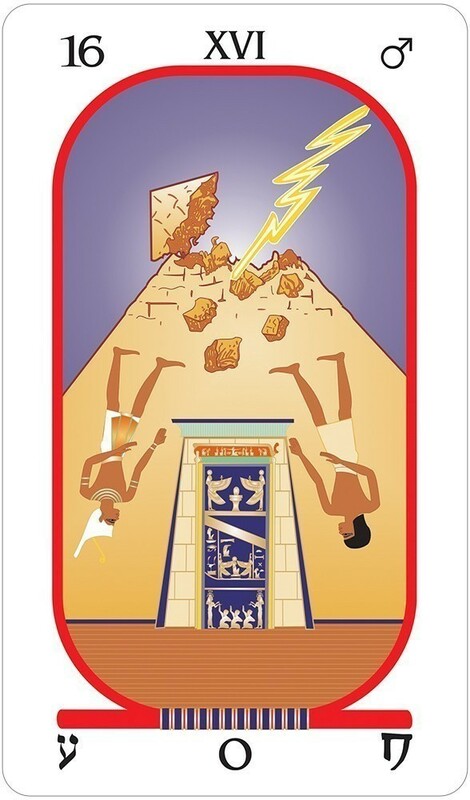 I was honestly surprised that I received good readings out of this deck, simply because I had dismissed it at first as "another Egyptian deck" that I (personally) wouldn't relate with or understand. Not being interested in Egyptian decks, I didn't think I would get anything useful out of this deck, and I'm glad to say I was wrong. I can definitely see the benefit of learning this interesting system sometime in the future when I have more time to devote to it. Overall, I was unexpectedly impressed with this deck, and that's saying a lot. I thoroughly enjoyed the surprises I would get when I'd flip to the book and read such accurate descriptions of what I had asked the cards about. And I absolutely love the role the Horsemen play in the deck. I would definitely recommend this deck to anyone who isn't afraid to learn a new system, or refer to the LWB for readings. If you do have the time and interest in learning the method, I assume the book (The Sacred Tarot) would be a wise accompanying investment.